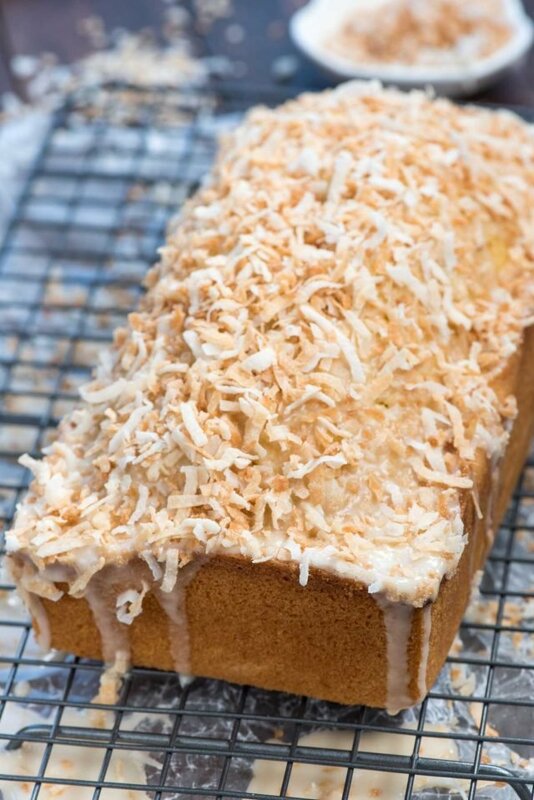 Homemade Coconut Pound Cake is an easy loaf cake full of triple the coconut flavor! It’s soft and sweet and the perfect pound cake for coconut lovers. This post is sponsored by Almond Breeze, which means that some of the coconut flavor in this pound cake comes from a blend of Almond Breeze almondmilk coconut Unsweetened Original – my favorite flavor! You know what coconut always reminds me of? Hawaii! That’s why looking at these pictures makes me sad…I miss Hawaii. Coconut just reminds me of all things tropical, even when there isn’t any pineapple or passionfruit or anything inside. The other thing that coconut reminds me of is spring and Easter, because that’s when you start to see tons of coconut recipes showing up around the internet. Now, for me, coconut is a year-long delight and not just reserved for spring, but somehow that’s the season for it. Maybe it’s because everyone is dreaming of summer and Hawaii? This Coconut Pound Cake is reminiscent of my Coconut Cupcake recipe, but it’s completely from scratch. I’m not stranger to pound cake recipes on this blog (lemon and champagne are my two favorites) but this one is edging those out as the most popular in Dorothy’s dessert repertoire. This pound cake loaf has triple the coconut flavor: coconut milk, coconut extract, and toasted coconut! One of the things I love about pound cake recipes is that you can make them in loaf or bundt pan form. I like making them as loaves because then it’s only half of a full cake. 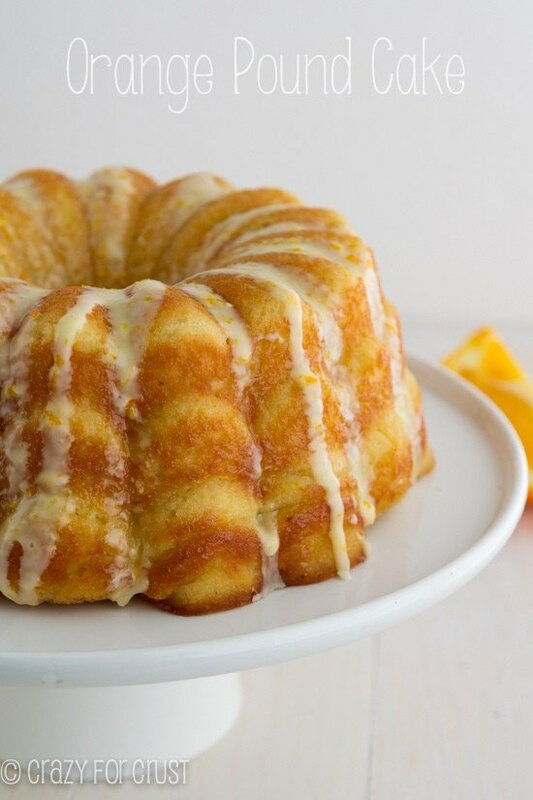 This recipe is adapted from my Orange Pound Cake recipe (which stemmed from the lemon one). Those made 2 loaves or one 12-inch bundt. This makes a nice and simple pound cake loaf that’s perfect for an easy dessert (or even brunch). There are so many ways to make a pound cake. I have friends who’ve made coconut pound cake from a cake mix, but I love this homemade version. It’s a toasted coconut poundcake made as a loaf! Let’s break down the recipe. 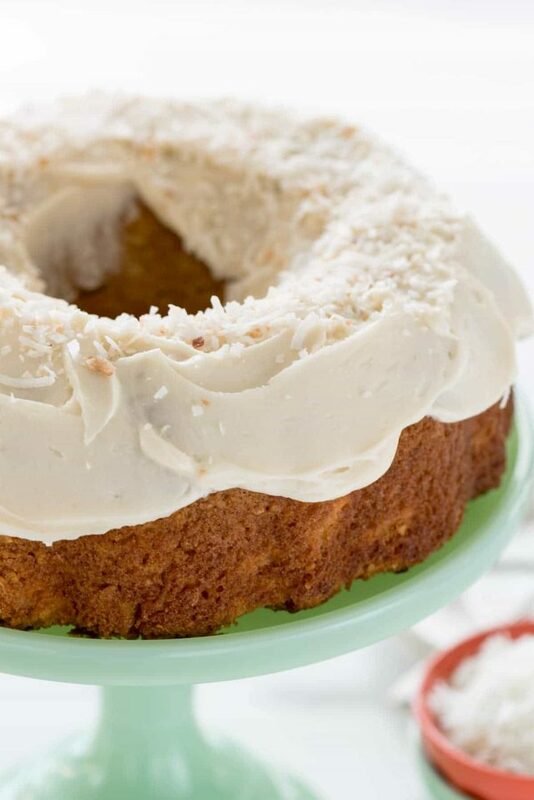 This easy homemade coconut pound cake recipe has triple the coconut flavor from extract, coconut milk, and toasted coconut. Some pound cake recipes have sour cream, but I find that this recipe is moist and soft without it. I know traditional loaf cake recipes have butter, but I started this with vegetable oil. It makes it easy to mix up without a mixer! You can use melted butter, if you prefer. Coconut extract really amps up the coconut flavor of the cake. Don’t skip it! I top the cake with tons of toasted coconut. I love the smell and crunch it adds, as well as flavor. Learn how to toast coconut here. While some pound cakes call for milk or buttermilk, I decided to amp up the coconut flavor and make my coconut pound cake with coconut milk, or almond coconut almondmilk, that is. I used Almond Breeze almondmilk Almond Coconut Blend Original Unsweetened in this recipe. 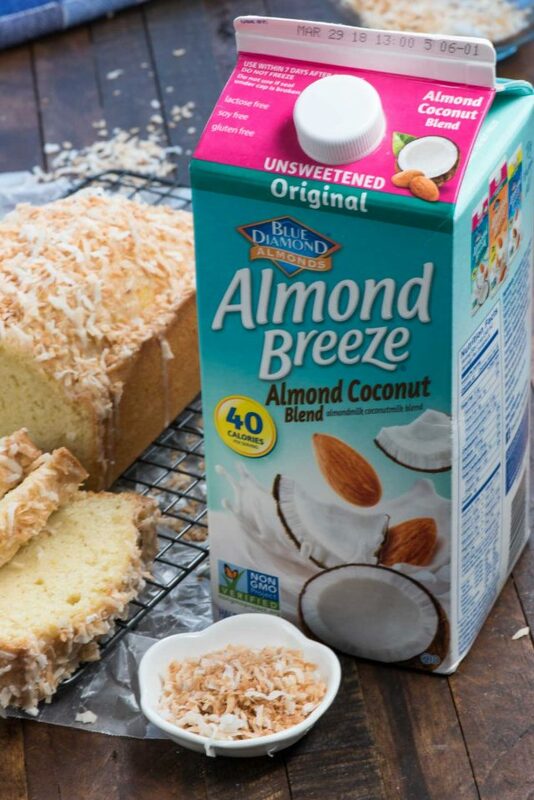 I absolutely love the almondmilk blends from Almond Breeze. The coconut blend has the most amazing smell and flavor: it’s not too coconut-y and is perfect to add to baked goods like pound cake, or to have on cereal. 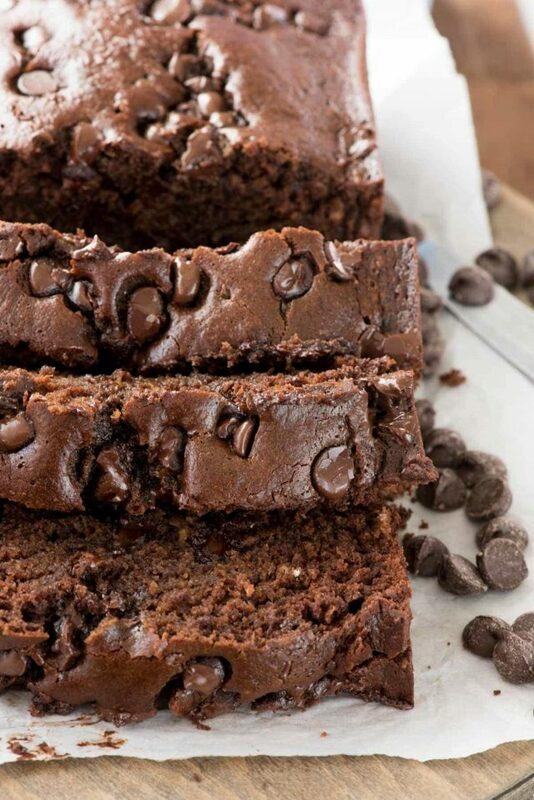 Using Almond Breeze and vegetable oil means that this cake is accidentally dairy-free, which is great for those with allergies or those trying to avoid diary. You don’t miss it, I promise. It was all I could do not to eat this entire cake! Make this cake to pretend you’re in Hawaii or to celebrate spring…or both! 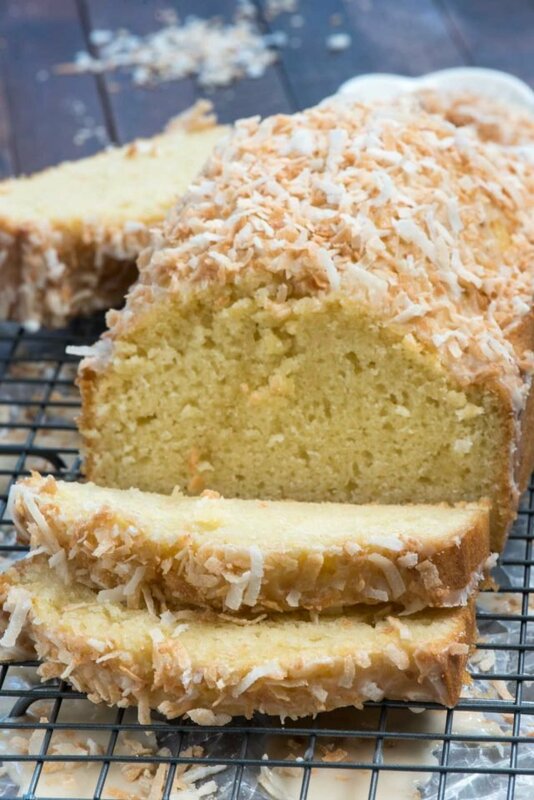 Homemade Coconut Pound Cake is an easy loaf cake full of triple the coconut flavor! 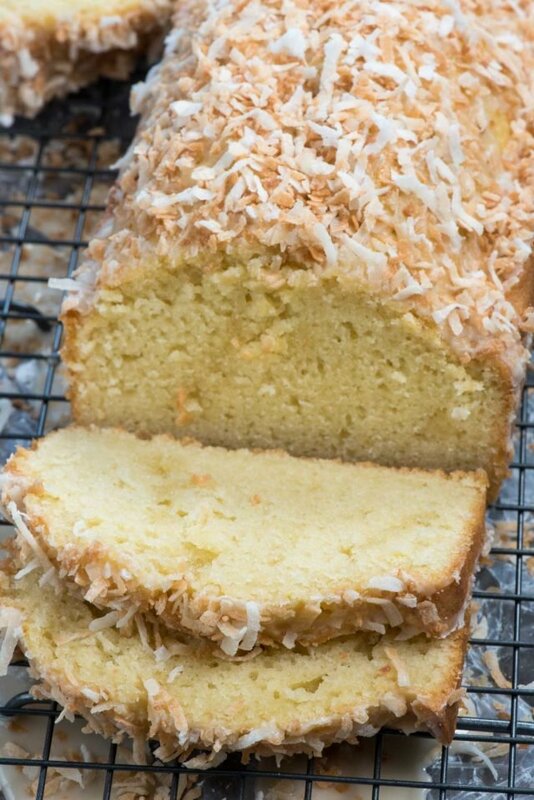 It's soft and sweet and the perfect pound cake for coconut lovers. Stir oil and sugar in a large bowl. Stir in eggs, one at a time, then stir in extracts, baking powder, and salt. Add the almondmilk and flour and stir just until combined. Pour batter into prepared pan. Bake for 50-60 minutes, or until a toothpick comes out almost clean. Cool completely before removing from pan. To make frosting: whisk powdered sugar, extracts, and almondmilk in a medium bowl. Drizzle over cooled cake and immediately top with toasted coconut. Let set, then slice and serve. This looks amazing and I love that you used oil. I know butter fans will disagree but I find butter-based cakes to be drier than oil-based ones and dry anything doesn’t work for me! Have never had coconut pound cake. Sounds yummy and we love coconut.